What an amazing birthday! My last post was anticipating the event but the experience was way better than I anticipated! The wind was better, the race was better, & ultimately my birthday was better! Lucky me. The race itself was challenging--we were in a dog fight with another boat pretty much the entire way down to Solomons--covering tacks at least a dozen times if not more--sometimes they were ahead, & sometimes we were. And the fish traps! Xing Fu warned that the boat could be swallowed whole & we all laughed...no way! But even under that full moon, we had our work cut out for us trying to steer clear. Sometimes you could hear a bunch of birds as they sat on top of the poles, but often, nuffin'! And at one point, crash tacking away so that the other boat could be clear ahead was critical. Also, as we crept up on another one, we realized that it spread out across the river like this one above--we were so close at one point we could've reached out & grabbed it! Hopefully no boats got caught up in it--didn't hear of any so maybe everyone was able to avoid these hazards this year. At midnight, the crew sang Happy Birthday & we toasted with a little wine--just before tacking to avoid the fish trap--no rest for the weary! At 3:30 AM, we were getting punchy--the glow from the huge gas dock could be seen for hours & we kept saying--"Oh, there's the gas dock!" for about 4 hours straight. And singing traditional sailing songs....while tacking to keep in the fight. It was a lot of fun, but I was glad to finish at about 7:45 the next morning--beating out 3 boats--including the one we battled with all the way down, that managed to pass us when we were under the wrong spinnaker earlier. We crossed the line 3rd but were corrected over by 2 boats which gave us 5th place...ah, PHRF racing--so close & yet so far. When we got into the marina, there were Bloody Marys & other birthday drinks made by my skipper & another friend: Painkillers for my birthday! Xing Fu drove down & brought birthday cake so another round of Happy Birthday. Needless to say, the morning was a bit hazy--by 1 PM or so, I needed to sleep so I found my way to the motel & crashed for about 3 hours until it was time to go to dinner. I think I heard Happy Birthday sung to me about 4 times that day--the last was a rousingly loud one by the entire bar at dinner--so fun! 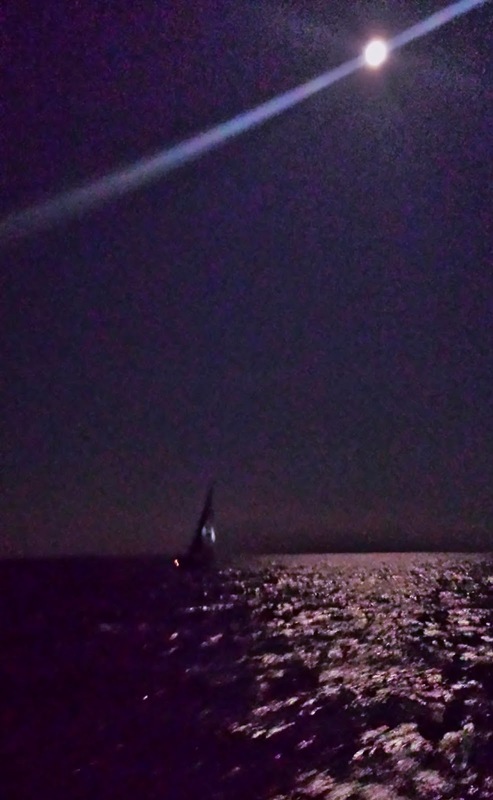 And it truly was a birthday for the record books--thanks to all of my sailing friends for such a super celebration!